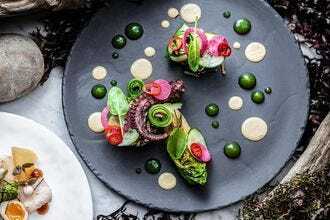 Whether you're a local looking to shake up your lunchtime routine or a visitor on the hunt for something tasty, these Vancouver restaurants will squash your hunger pangs. Sandwiches and salads are the quintessential lunchtime meal and Railtown Cafe does it right. They roast their meats in-house and make everything from scratch. 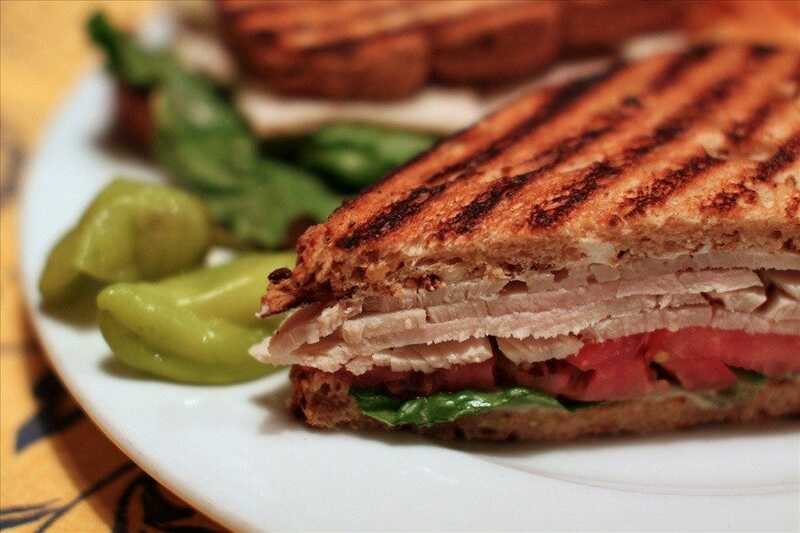 Sandwiches are served on freshly baked bread and their salads give you options they've created or to create your own. Save room for their baked goods-the peanut butter crunch bar is decadent and delicious. For something healthy, filling and flavorful, Nuba Restaurant is the place to go. 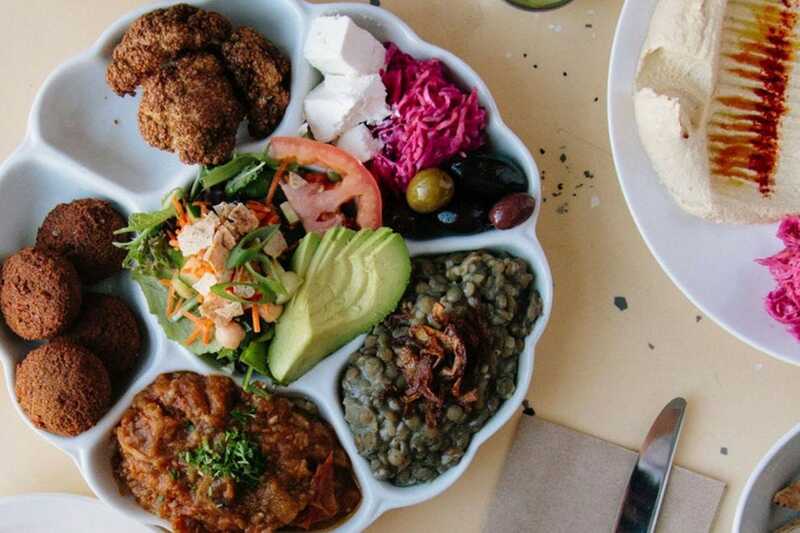 This Lebanese restaurant serves vegan, vegetarian and meat options and it's hard to go wrong with any of them. 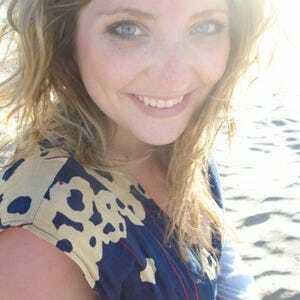 They have a few different locations around Vancouver so chances are there's one nearby. Think fresh juices, tasty mezzes, packed pitas and generous plates with hummus, salad, your choice of protein (or vegan option), and rice or potatoes. If a liquid lunch is on the cards, head to Chambar. 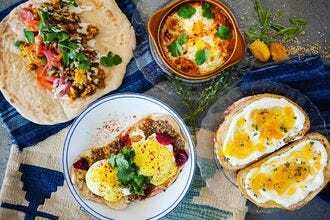 Known for their Belgian-North African cuisine, this busy spot serves some of their much-loved brunch options on their lunch menu. The short rib fricassee is so good. The beer, wine, and cocktail menus are plentiful. 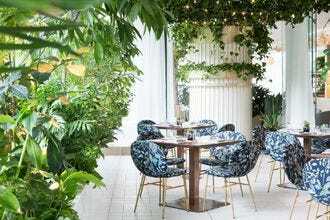 It's a great place to enjoy a leisurely lunch. There are so many great sushi options in Vancouver and if you find yourself downtown, this Japanese owned and operated sushi joint is a must visit for healthy appetites. Whether you're going for lunch or dinner, Shizen Ya always brings a packed house. So much so, they had to move a few doors down from their old location to accommodate more seats. The menu features the usual suspects like spicy tuna, salmon and avocado, dynamite and California rolls, but they also have some specialty rolls. The Sakura Blossom is filled with real crab meat, spicy albacore tuna and avocado, and topped with wild salmon and a creamy maple drizzle. It's tasty! They also have a bunch of vegetarian and vegan options, along with rice-free rolls, gyoza, udon, teriyaki, sashimi, whole wheat tempura, salads and more. 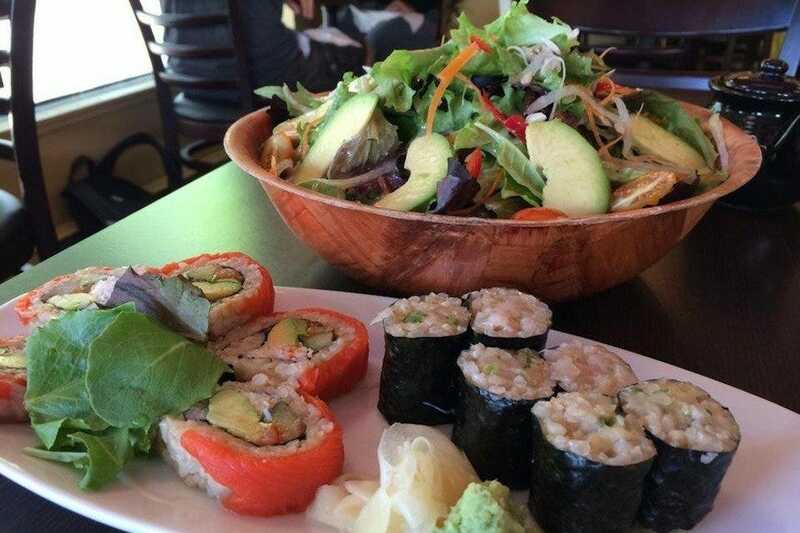 In addition to making all of their rolls with brown rice, they use organic and Ocean Wise ingredients. 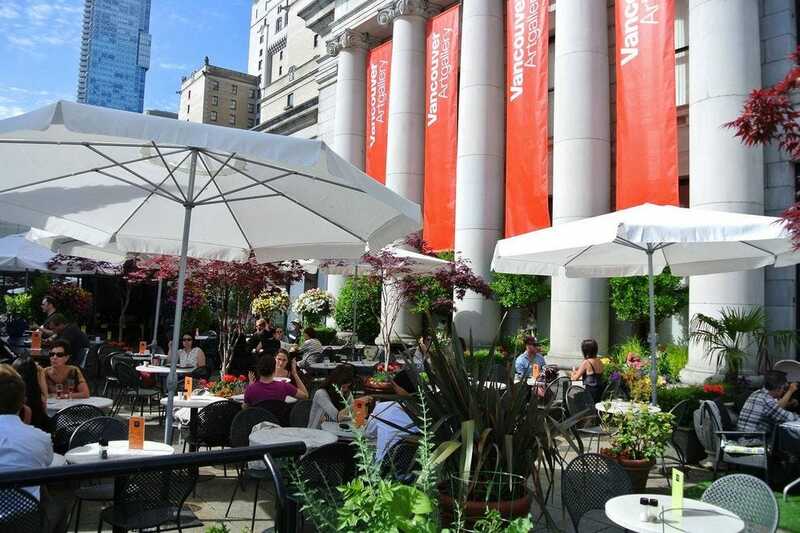 With neoclassical architecture, soothing music, and plenty of lush greenery and bright blooms, The Gallery Cafe & Catering is one of Vancouver's outdoor spaces to enjoy lunch. This casual cafe calls the Vancouver Art Gallery and it's open from morning until early evening. 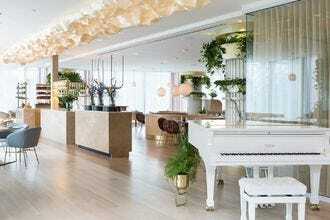 What's great about this spot is that you can have a quick lunch, or sit back and enjoy a leisurely meal. Service is cafeteria-style where you go up to the counter and order your ready-made dish, pay for it at the till, and take it to your table. On the menu, you'll find freshly made soups, salads, sandwiches, quiches, hot entrees, and desserts. Everything is made from scratch here, too. 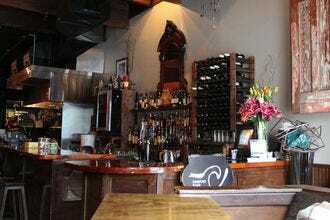 They're fully licensed so you can enjoy a glass of wine or a cold beer with your meal. During the summer months, the patio is the place to sit. When the weather's less than desirable, head inside. 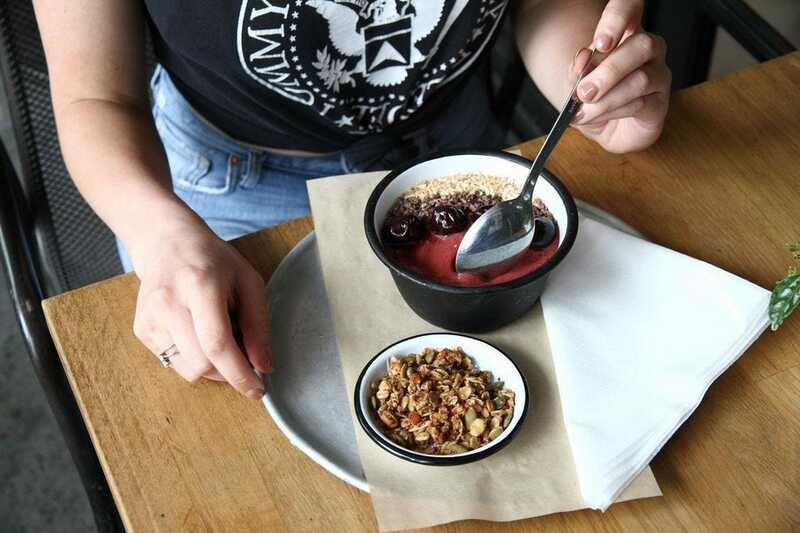 Located on Kitsilano's West 4th Avenue, Tractor's menu has a focus on using as much local and seasonal ingredients, with options for vegetarians, vegans, gluten-free and meat eaters. Enjoy filling salads, sandwiches, soups and proteins that are prepared in small batched to guarantee freshness. The cafeteria-style set-up means that you won't be waiting long for your food, and the best part about this 'fast food' is that it's healthy! 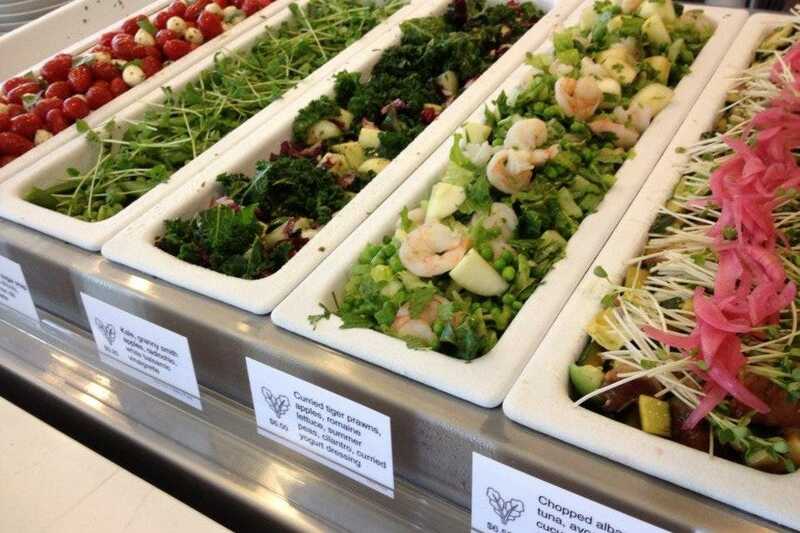 When you walk up to the counter, you'll see about a dozen different salad options. You can choose the number of scoops you'd like and can mix whatever you want. You can also top your salad with grilled chicken, tofu, avocado, or albacore tuna. If salad's not what you're craving, they have soup, stew, and sandwiches. With plenty of variety, your taste buds will never grow tired of the ever changing menu and seasonal flavors. This cozy cafe on the edge of the financial district and Gastown is a hot-spot for those craving a homemade, gourmet sandwich. 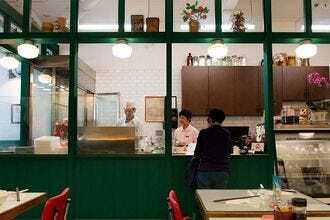 The shabby chic interior makes diners feel at home while they dig into their hearty fare. Finch's extensive baguette list to choose from makes it hard to choose. If you're looking for something with meat, the pear, prosciutto, blue brie with toasted walnuts has a devoted fan base that go there just for that. Want to skip the meat? The vegan and veggie options are also robust and filling. If a sandwich isn't what you're in the mood for, they also have a number of cheese plates, salads and daily soups to choose from. Craving something sweet? Their freshly baked banana bread and cookies are always a hit. Chambar's one of the few restaurants that's open first thing and closes late in the evening. This bodes well for hungry diners in search of a delicious meal any time of day. Whether you're here for breakfast, brunch, lunch or dinner, the Belgian-North African cuisine brings beautiful dishes to the table. Business or pleasure, lunch at Chambar is a solid choice. 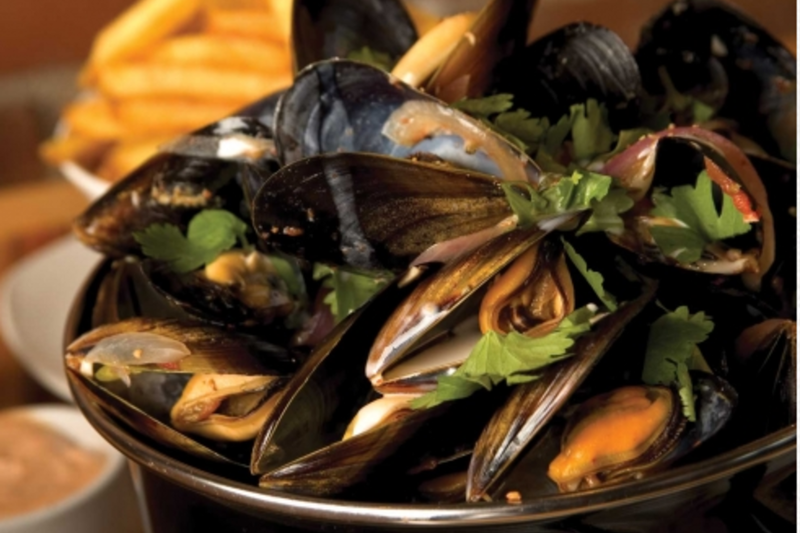 The buzzing atmosphere and flavorful menu make this place a popular spot amongst locals. For food, tuck into hearty dishes like the short rib fricassee. This favorite dish is made with braised short ribs, balsamic cipollini onions, potatoes, watercress, fried eggs, and applewood smoked cheddar. It's rich and delicious. For something lighter, try the mezze platter. It has a little bit of everything: salads, dips, haloumi cheese and other tasty bites. If it's one of 'those' lunches, don't miss the cocktail menu. 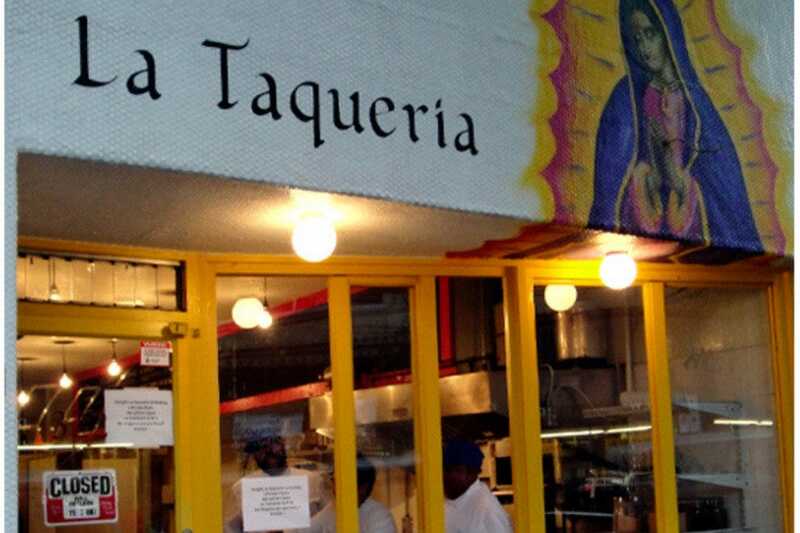 Authentic Latin and Mexican fare is hard to come by in Vancouver, but La Taqueria does an excellent job of bringing the flavors of the South to the North. Choose from items like de cachete (tender beef cheeks), carnitas (pork confit), pollo con mole (chicken in a mole sauce), pescado (fish), and the popular de lengua (beef tongue). There are also a number of vegetarian options. If you venture that way, make sure to order a rajas con crema (roasted poblano peppers with creamed corn, sour cream and Mexican cheese). There are a few different homemade salsa options and some freshly pickled vegetables to add onto your taco that will add some welcome heat. To complete your meal, grab a horchata. It's creamy, dairy-free, slightly sweet, and has warm hints of cinnamon. It's almost like dessert! If you see a line-up, don't worry as it moves quickly. With a workout studio, a place to hang out and get work done, and a tasty menu to fuel your day, TurF has created a rich community in Vancouver's Kitsilano neighborhood. What makes this spot for lunch so great is that you can hit up a workout class and then enjoy a nutritious meal that'll give you the energy you need to get you through the day. The food menu is broken up into toasts, bowls, salads, happy protein, sides, flatbread, smoothies, baked goods, dessert, and a variety of drinks (including beer and wine). 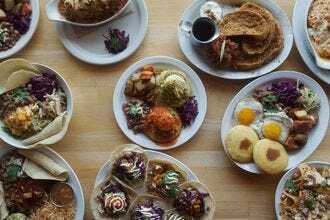 This packed menu has much to offer vegan, vegetarian, gluten-free, and meat-eating appetites. 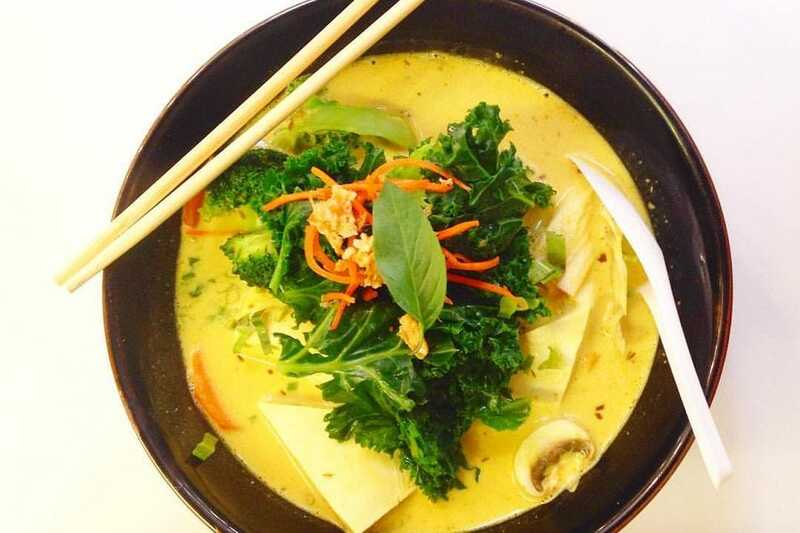 This family-run business serves vegetarian and vegan Vietnamese food. It's a local favorite because when it comes to taste and satisfaction, CHAU always delivers. You may think that cooking Vietnamese food without fish sauce may be a challenge (and for many it is), but owner Maria and her mother have concocted an excellent substitute that doesn't compromise flavor. From fresh salad rolls to warm, comforting bowls of noodles and soup, the menu boasts plenty of healthful and tasty options. 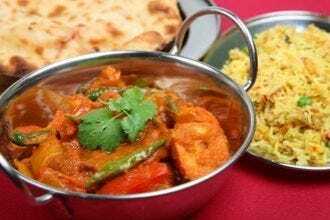 Each dish speaks for itself, but the reasonable prices and large portions certainly sweeten the deal. This Granville Island location is a great when you want to grab something to-go and enjoy it outside of the Public Market, or take it home. 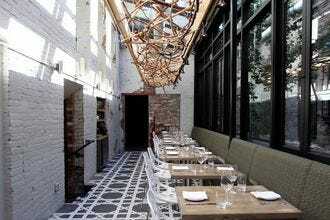 Nuba is one of Vancouver's favorite restaurants and over the years has expanded to multiple locations across the city. Nuba specializes in Lebanese dishes that satisfy a variety of different appetites. 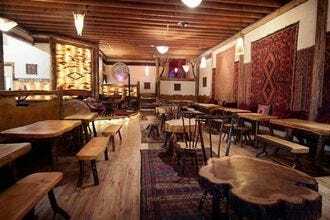 On the menu, you'll find hummus and baba ghanouj to the falafel and grilled meats so there's really no shortage of choice. An added bonus? This Lebanese cuisine is quite healthful. Each item on the menu is very reasonably priced and made from quality, local ingredients. For lunch, the pitas are the perfect midday meal. They're quite filling and packed with plenty of tasty ingredients. Wash it all down with one of their fresh-pressed juices. This West Hastings restaurant is a very popular lunch location amongst the business district workers. Railtown Cafe got its name from the neighborhood its first location calls home. While the Railtown location is the original, locals can enjoy one of two other spots: Downtown Vancouver and Main Street. Railtown's known for their sandwiches and salads because they're big, hearty, and made from scratch. While the slow roasted meats in their sandwiches and salads are delicious, they also have vegan and vegetarian options. 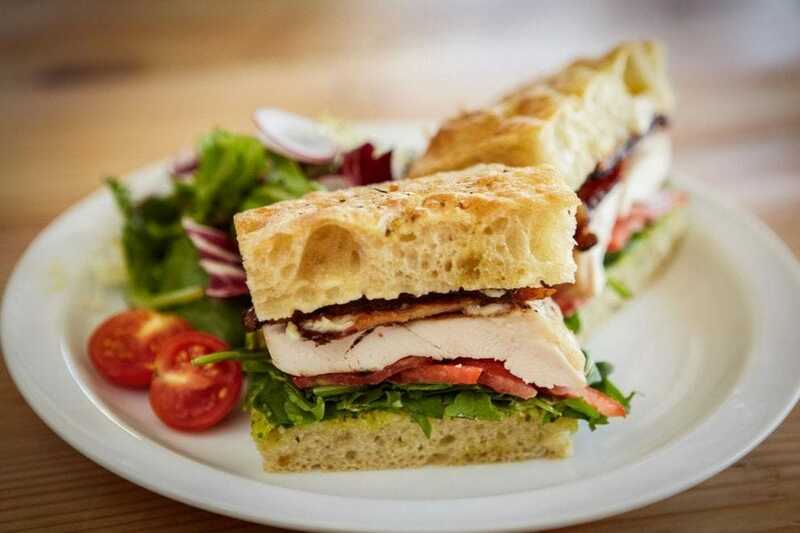 Sandwiches are served on freshly baked focaccia, rye, baguettes, sourdough, multigrain... you name it, they've got it. The salad menu is robust and if you have a particular craving, you can create your own. From honey-roasted carrots and pickled cauliflower to crispy chickpeas and squash chips, there are some fun and flavorful ingredients to include. They also have soup and daily specials and awesome baked goods.